Additional information about Fear a’ Tí: John is a local man and lives within ¼ mile of the house. Address of Storytelling House: Lower Street, Oulart, Co. Wexford. Additional Comments / information regarding this Storytelling House you wish to include? 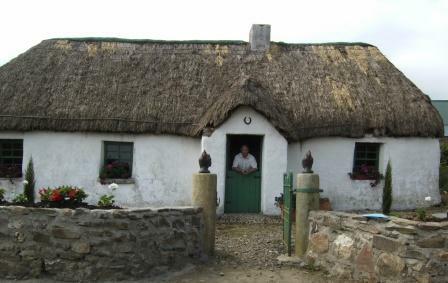 This is an original thatched house of over 200 years old with a big welcoming open fire and no electricity. It has stood there in more or less its present form since the 1798 Rebellion and was lived in up to 1992. It was restored in 1995 – 1996 to its original form. Directions to the Bygone Days Storytelling House, Oulart, Co. Wexford are indicated on the map below.